Use the quick navigation on the right to get straight to the depreciation rates for each RV type. Today I would like to talk about RVs and how they lose value over time, known as depreciation. We’ll talk about Class A’s, Class C’s, travel trailers and fifth wheels. There are people that believe you should never buy a new RV, while other people have never thought about buying a used one. We’re all in different financial scenarios and do things differently, so there really isn’t a right or wrong. Keep that in mind and in the end, do what makes sense to you. Brand – Some RVs and trailers are made better from the start and depreciate slower. Take a look at Airstream trailers and you’ll quickly notice that the depreciation is slower on those trailers. That isn’t just because of brand reputation and quality, but the demand. Demand drives prices up and down so don’t go buy an Airstream and think that it will lose value as fast as a lower quality trailer. Location – Where you are going to buy or sell matters. If a trailer is manufactured in the west and you live in the east, the price you’ll pay in your state for that trailer new will include shipping. But when the time comes to sell the trailer, you might have to forget about the shipping cost and sell your trailer for however much it costs in the west where it was made, because your buyer can be comparing to prices in the whole country. Time of the year – There are fewer trailer sales in the winter and more in the spring, so if you plan on selling your trailer, plan ahead and do it at the right time. On the other hand, if you’re buying, you might be able to find a better deal in October/November as the dealership is trying to clear their inventory out. If you’re buying in the spring or summer, the chances of getting a great deal are smaller. State of the economy – The economy in your country is a big important factor to whether you’ll get a good price when selling or buying. If the economy is down, people have less money and are more careful with spending. When the economy is up, there is a higher demand and dealerships won’t give you an incredible deal if they know that someone else might walk in tomorrow and buy it for more. State of the RV – If you’re planning on selling the RV, the shape it’s in will matter. Just because the average depreciation value for a travel trailer might be 50% (for example) doesn’t mean that you will sell for that much or little. How much you’ve used it and stored it will be the big ones but also what kind of work you’ve had to do on it. Don’t overvalue work you’ve done, it doesn’t matter how much you spent on fixing the leaky roof, as it’s a basic functionality of a trailer and not something a buyer should be paying extra for. It’s different if you’ve replaced the roof completely on a 10-year-old travel trailer and it’s only a few months old. The reason I wrote these factors down is that I don’t want you to get discouraged or led wrong with the numbers below. While you will see an average depreciation percentage, remember that it’s a general guideline and not true for all RVs. MSRP (Manufacturer’s Suggested Retail Price) is the list price that you’ll often see on dealerships websites or locations. There’s often marketing ploy like “30% OFF MSRP” below it to trick you into thinking that you’re getting the best possible deal. The truth is that nobody pays the MSRP price, and the dealership knows this. Any serious dealer expects you to negotiate so know that their sale price often isn’t the lowest they’ll go. You could very well get an additional 5-20% off depending on demand and time of the year. I visited 20 different dealerships from different states online and picked five trailers from each at different price points to calculate what the average difference was between their “sale price” and the listed MSRP. The total average on travel trailers and fifth wheels was 34%. So MSRP was on average 34% higher than their sale price. This means that when you drive off the lot, your out of the door price should be at least 35-40% off the MSRP in my opinion. These kinds of numbers might be harder to reach on a Class A and Class C.
Why am I going through this? Because this is also a factor that plays into the percentages you’ll see below. Some dealers mark up their trailers more than others, and since we’ll be seeing an average percentage that is based on their list price, you’ll have to take this into consideration. My wife and I put together a list of 160 RVs. 40 of each RV type that we’re looking at. 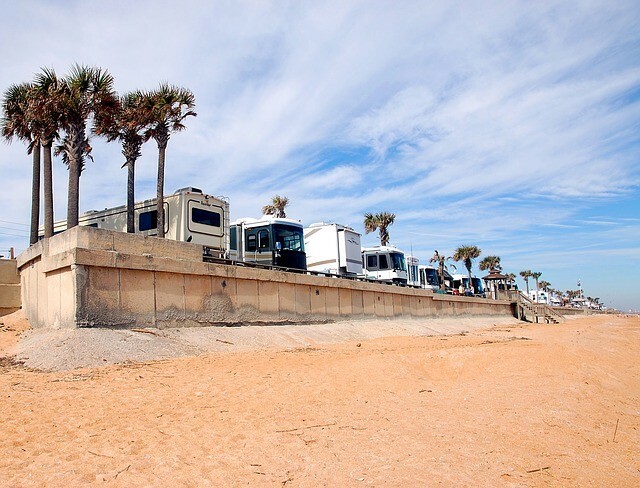 Class A, Class C, Fifth Wheels and Travel Trailers. You might have read somewhere that fifth wheels and travel trailers depreciate at the same rate, but according to our calculations, there is a big enough difference to put them into their own tables. As both are a big market on their own, it made sense to us (although it took us a few extra hours). What we then did was go on Nadaguides and RVTrader and started looking at each trailer from each year starting with the 2019 model as new. From 2018 we looked at used, and so on. We tried to make sure the options selected on Nadaguides were as close as possible to the trailer for sale. We picked RV’s from different brands, states, and price points. We quickly ran into a few trailers that were new models and not on sale 10 years ago, so what we did then was found a new trailer and added that to the list as well, so we ended up with about 250 RVs in total. Because of this, year 1-8 will be based on more data than year 9-20. We did the best we could with the data we had. We’ll assume that the average new Class A costs $120,000 out the door. The difference between year 1 and year 2 isn’t huge. But do the year 2 models sell? The bigger drop between year 2 and 3 could indicate that a lot of Class A’s that are two years old don’t get sold, and then in the third year the price goes down because of this. Just speculating. If we imagine that we buy the Class A for 35% off MSRP, it’s down to half the MSRP value after just one year. The biggest drop is in the first year, which tells us that new RVs lose 5-18% when you drive it off the lot. With a Class A, this is a lot of money lost in depreciation. Class C’s depreciation rate is lower than the rate of Class A’s. Why? Could be because they’re cheaper and more people can afford to buy them. Class A and C depreciation rates are somewhat close to each other until after 10 years. Then the Class C slows down. First thing to remember is that we should take these percentages with a grain of salt, each percentage shown in each table is a very general average rate. The $-amount in each table is there to show what that percentage looks like in numbers, not to be the correct average value of RVs. Class A’s depreciate a lot, especially after year 10. This could have to do with engine work that usually has to get done around this time or mileage. Let me know what you think could be the reason. Class C’s don’t depreciate as fast. Most likely due to them being cheaper which means that the demand is higher since more people can afford them. As soon as you drive off the lot, no matter what kind of RV you’ve bought, you’ll lose 5-20%. I saw some incredible deals from dealers, I found several new RVs that were cheaper than two-year-old used ones of the exact same model. Not all of the used ones were priced high according to NADAguides either, which shows that there are good deals out there, especially in the late winter/early spring months. Say that you’re planning on buying a used RV. Use these numbers to figure out what a good year to buy from would be, meaning the years when RVs depreciates the most. Let’s look at some examples. Class A’s depreciates almost 4% on average between year 5 and 6, that’s some savings right there if you plan the purchase right. Fifth wheels depreciate on average 5.7% between year 4 and 5. As you can see, if you plan your purchase you can save more or less money by choosing an RV that is a little bit older or newer. Scroll to the table about the kind of RV that you have. Example: I have a travel trailer that I bought for $25,000 new, it’s a 2015 model so it’s four years old. I’ll go to the travel trailer table above and take the percentage next to year 4, which is 31.3%. Then I’ll head to Google.com and input “25000-31.3%” and hit enter. The value that returns is 17,175, this is how much my travel trailer is worth based on the average rate. Let me know if you have any questions down below and I will do my best to help you.